Customize your next presentation with these navy blue Ambassador with Window. With these windows, you can showcase your company?s logo, the project?s title, or anything else you want people to see first. These hard covers have a leather-style outer texture with a 5 9/16? x 4 3/16? die-cut window. It's an easy process--all you need is a Coverbind binding machine--no crimpers required. These navy blue Ambassador with Window covers have a durable EVA adhesive glue strip with an embedded book binding fabric, unique to Coverbind. Promotional Pricing: Limited time only! Spine Size: 1/8" - 1"
Cover Size: 8.5" X 11"
Welcome to MyBinding video. This video looks at CoverBind’s Ambassador on Demand Thermal Cover. This attractive, hard bound thermal cover is all you need to meet a customizable on the go professional cover. With a built in adhesive right into the spine, thermal binding has never been simpler but the real strength of the Ambassador on Demand is the front cover has a debossed area for a custom printed label that’s included in the box. 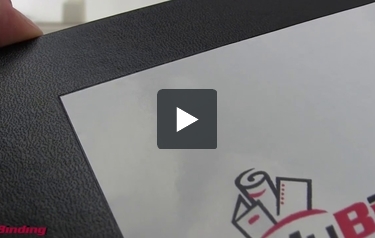 This allows you to create personalized hard covers using your inkjet or laser printer. The labels are standard 8 ½ x 11 sheet that you design and print off or even photocopied on to. Remove the deep couches like you would any sticker and centering up using the debossed area as a guide. Go slowly, gently and spread out everything nice and smooth and you’re all set. That looks great for just a few minutes of work. Think of all the presentations or home or school projects that can be presented with extra flare with this and they work great in all the CoverBind thermal binding machines. That is Ambassador on Demand. For more demos, reviews and how to’s, check out MyBinding.com. Welcome to MyBinding video. 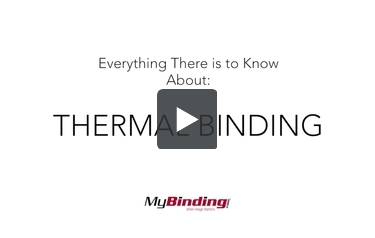 This is everything you need to know about thermal binding. If you are looking for a binding that’s quick and simple to make, then thermal binding may be a good option for you. The one piece cover has a glue strip in it and all you have to do is place your pages in. Depending on the size of your books and the machine, you can bind multiple books at the same time. You can find different size hard covers to carry up to 500 sheets and soft covers up to 100. Your pages should closely fit the size of your binding, otherwise you might find yourself with awkward gaps. There are different colors and customizations available for your thermal binding covers. Using a standalone glue strip works within the same binding machines. Cut it to length to repair worn book spines or make your own covers. As you can see, this is a permanent solution. There’s no easy way to edit your books once it’s complete. And that is thermal binding. For more demos, reviews and how-to’s, go to MyBinding.com.